I'm feeling especially thankful for the wonderful gifts that I've received from family and friends over the last few days so, inspired by this month's celestial theme over at The Altered Element, I've started to put together some cards. To start, I sifted through my scraps of Bazill Smoothies Cardstock to make a card base and then found a few co-ordinating leftovers from scrapbooking projects. I then trimmed my cardstock and papers to size and added some definition to the edges by adding stitching and by using a variety of inks from the Tim Holtz Distress Inks Range. To make my greeting, I used some Alpha Beads (which are, unfortunately, no longer in stock) along with some smaller beads from the Blizzard Glass Bead Mix as spacers between each word. These were threaded onto some Silver Coloured Copper Wire and I fixed them in place with a little superglue. I then bent the wire around a layer of card and began fixing each of the card and paper pieces to the card base. At this stage, I decided to add a little extra sparkle to one of the papers by dotting some Cosmic Shimmer Twinkles around the edge. There can never be enough sparkle! 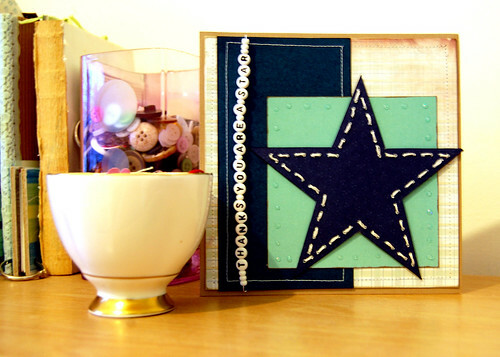 To finish off my card, I embroidered a star onto some card using some White Venus Embroidery Thread, cut it out and added it to the top of the card using some Mini Mounting Pads. This will be my last Design Team project for The Altered Element before the shop officially closes at the beginning of January. It's been a huge amount of fun and I shall miss the team dearly. But, don't forget that you can still order from The Altered Element until midnight on the 1st January 2011 - so don't miss your chance to pick up some bargains in the closing down sale.